Roger Stern interacting with a group of MET Service staff and researchers in Riga, Latvia. Weather and climate data provide crucial information for governments and organizations, allowing farmers to time their crops or how to use water resources more efficiently to manage implications of wet and dry seasons across different sectors just to cite a few examples. Despite this critical need many African countries lack sufficient software tools and enough capacity to analyze their historical climatic data-sets. Given the importance bridging this gap the past two years have seen us develop a special Climatic Menu in our new and open source software; R-Instat. This menu makes it easier to analyze past climatic data and determine weather trends such as start and end of rains. Early this week our team members Shadrack Kibet and David Stern were out in Maseru, Lesotho where they met with the Lesotho Meteorological Services director and the staff at the met services center. R-Instat users from Lesotho Meteorological Services. David and Shadrack led a workshop which used R-Instat to help them with data cleaning. The workshop participants identified issues in the data such as minimum temperature values greater than the maximum and then referred back to the paper record to correct them where possible. 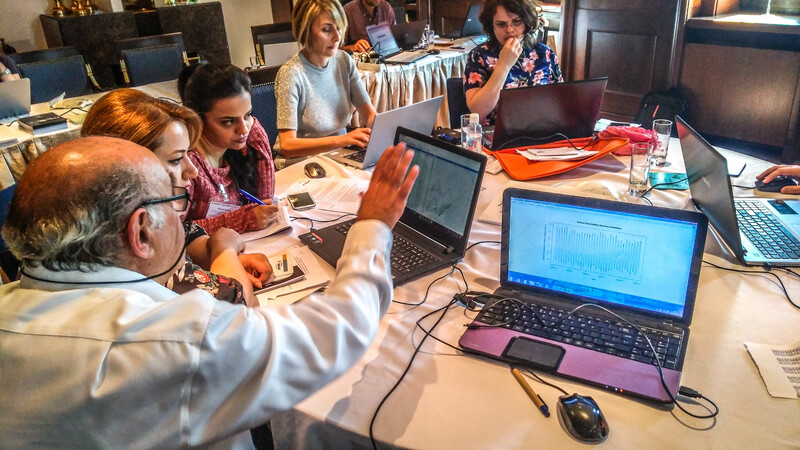 The workshop split into two with some members moving on to produce graphical visualizations of the data, which can help make the large amounts of climatic data easily understandable. They also had discussions about Climsoft; climatic database which is designed to store historical climatic data in a secure and structured manner. Feedback from the participants indicated that indeed R-Instat was useful. To quote one of the participants “We would like to have more of such (R-Instat) training in the future and maybe expand this to staff at the stations. Most of this errors can be easily resolved at station level unlike here where it takes us long to resolve them”. Feedback from the group doing the analysis was similarly positive, with the statement that this was the first time they were learning how to analyse the data themselves as they need to for many aspects of their work. At the same time a related workshop has also been taking place in Riga, Latvia where Danny Parsons and Roger Stern interacted with a group of MET Service staff and researchers from across Europe. They were investigating the use of satellite data for climate services. Using The Satellite Application Facility on Climate Monitoring (CM SAF) satellite data, some participants used R-Instat to compare climate estimates from satellites with observations from the ground. Understanding this relationship is potentially highly valuable as satellite data could help provide valuable climate information in areas without ground data or where ground data is missing. This could be even more useful in Africa where ground stations are sparse and a similar workshop for African MET services will take place in Pretoria, South Africa later this year. For example, this climate information could help in decision making and planning, helping governments and other organizations to better anticipate extreme weather events and climate trends. This year was the first time R-Instat was included in the European workshop, although it as designed for Africa and developed largely in Kenya it went down extremely well with the European audience. They were able to achieve much more than at previous events which did not include R-Instat and in the feedback even experienced R users were wanting to use R-Instat for their analysis. These experiences have been highly motivational for the R-Instat developers, it has been a long road and the end is nowhere in sight but it is nice to see the potential for global impact.